Yesterday’s post on the Hamper Test got me thinking about bike clothes. You see, back in the day, I worked at bike shops–five to be precise. The last one specialized in high-end road bikes and their ostensibly requisite gear. While I sold some stuff to racers, for whom shaving a half-pound off their ride might give a competitive advantage, the bulk of my customers were middle-aged men whose main sorties were medium-paced group rides and solo trips. You’d think, given how these guys used their bikes and their physiques (read: not lithe), they’d want fairly bomber, functional bikes. But no, these guys wanted super-skinny tires and obsessed about their gear as if they were Jan Ullrich making a podium push in Paris. My last shop job was in the early aughts (hence the Ullrich allusion), when top-end bikes were titanium and the most cogs you could fit onto your freehub was nine. A top of the line bike–like the most expensive you could possibly make–would run around $8K. In following decade (let’s call it the Lance decade), things got entirely out of hand. Companies kept shoving cogs onto freehubs. Power-meters and electronic shifting became de rigueur. Everything became carbon fiber. It became totally normal for bikes to cost in excess of $10K–mid-level bikes with Ultregra! And who’s buying all this cool kit? It’s those same middle-aged guys (nobody else can afford it). It’s out of hand. The trusty bike, so purposeful and simple in spirit, has become a techno-overkill parody of itself. 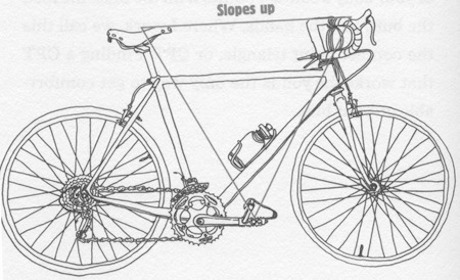 Petersen starts the compact, illustrated book by stating his mission: “To point out what I see as bike racing’s bad influence on bicycles, equipment and attitudes, and then undo it.” It speaks directly to the multitudes who have been led to believe they can’t mount a bike without a chamois on their asses. Why most of us should be riding in an upright position, with our handlebars higher than saddle (see above). The myth that cycling will get you lean strong and lean. How blinking lights reduce safety. For some people, these aren’t revolutionary ideas. Bikes are for riding. Who cares about weight and going fast? But for others indoctrinated in racer culture, for whom lighter is always better, these are, as the book’s name implies, radical propositions. They were for me. Suddenly, biking became a lot easier to do and prepare for. I haven’t worn my bike shoes since reading the book. When I put together a new bike, I built up a 30+ lb all-rounder with an eight-speed internal geared hub, bomb-proof wheels and full fenders (still no kickstand). Petersen is clearly a very opinionated guy and not all of his opinions are to be treated as gospel, but one assertion is hard to contest: if you’re not a racer, why use the same bikes and gear they do? Racers, particularly pros, have sponsors giving them gear, they have lots of money on the line for them to succeed, they have masseuses and fitness levels a couple orders of magnitude greater than the casual rider (chemically enhanced or not). The vast majority of us are best served by solid, repairable and comfortable bikes (not cheap ones, mind you). 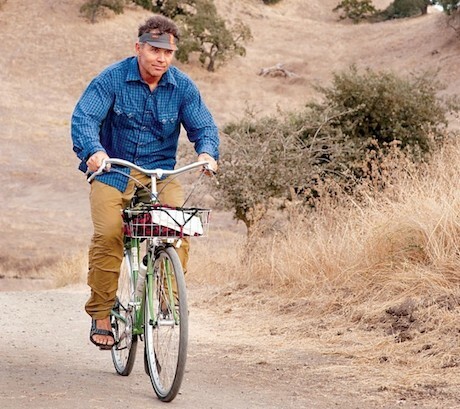 For this latter category of rider, Petersen transforms biking into something it might not have been since we were small children: fun and simple. As a luthier, I see the same attitude on guitars. Most US $5000 guitars aren’t bought by professional musicians but by attorneys and accountants (so to speak) who hardly play more than a handful concerts per year. Real musicians, whether full-time workers or “weekend warriors”, know that 1200 bucks can buy a solid guitar that can last decades with proper care. But this market is driven largely by advertising the idea that the more expensive the better it is. Breaking news: that’s false! Most exotic wood tops are just 1mm thick veneers, all “custom shop” wooden parts are made by the same CNC machines (a.k.a. robots) that carve $200 bargains, and intrincate inlays are also made by computer controlled machines using plastic instead of mother of pearl. Yes, a truly hand-made guitar can cost five grand, but those can’t be made by the hundreds per year. (Just ask Linda Manzer). Whether you’re speaking about bicycles or guitars, what 90% of people really need is a dependable machine that can stand up to the harshness of the road. Strip away the luxuries and even an US $800 guitar can perform as good as any professional instrument if they are inspected and maintained by an experienced craftsman. Ditto for bikes. This principle applies across the board on so many things. I spent $350 on an unlocked 64 gb One Plus One phone which has similar specs to the iPhone 6 plus but I’d have to spend $850 to get the, basically, same phone. And, Apple sold over 20 million iPhones in the last quarter. I could have spent $180 on a Moto G which does all the same things (phone calls, texting, internet access, etc) but the package isn’t quite as appealing as the One Plus One or the iPhone. It’s all about making a statement. This is my ode to the cheap bicycle. I love them. When I was working full time to electrify as many bikes as possible I owned no less than seven cheap bikes, over half purchased (used and new) for less than a hundred dollars. The rest I spent between $130 and $279, which was for an adult tricycle. The one design that was the most fun to build and ride was an electric/gas/pedal hybrid built from a 99 dollar beach cruiser. I added a 60 Watt, 36 Volt electric wheel on the front and then added a $130 80 CC gas bolt on engine conversion, which was as much fun to add to the bike as it was to ride once completed. The only drag was it was no faster than my typical electric bike (22 mph), but it sure looked cool and made a lot more noise. The tricycle was my last electric bike project. I mounted a 48 volt 1000 Watt electric wheel on the front and loaded the factory basket behind the seat – over the rear wheels – with 160 lbs. of 12 volt Deep Cycle Batteries. Yes, 160 lbs. of batteries may sound excessive but when it comes to electric vehicles the more batteries the happier the electric wheel. For example the World’s fastest electric car has over 7000 NiMeHy batteries. That car can go over 300 mph, and this trike could cruise at 28 mph with a fresh charge. When I retired (at age 55) and closed out my storage unit I sold nearly all the bikes except for one electric bike and my folding bike – which was so compact that when folded in would sit in my van on the floor in front of the passenger seat easily. I eventually sold my last electric bike and included the last spare electric wheel in the deal. I now have balance problems due to a history of concussions and my bicycling days are over. Have you considered a recumbent trike? Granted, they are still bigger than a bicycle, but that could allow you to ride without worrying about balance… and back/neck pain! They can also be equipped with electric assist motors and some of them can be folded or dismantled with no tools to store them in any compact car when needed. Here are some links. Adult kick scooters rock as a minimalist form of transportation. Get a recumbent trike or a quad! Balance problems are then no longer a problem! It’s great to hear someone finally say this. This principle applies to so many things. We live in an affluent society where money buys images. If you’re out in public wearing racing gear, people think you’re a bicycle racer. Women will look at you like you’re an athlete. People will ask your advice about bicycling, assuming you are an expert. Other bicyclists will treat you as one their own. Money buys an instant identity. None of that happens if you’re wearing old jeans and sandals and riding a rusty old clunker bicycle from a thrift shop. People may assume that you’re a poor immigrant that can’t afford a motor vehicle. People may assume that you’re homeless. People may assume that you’re unfamiliar with bicycling, out of shape, and clumsily trying to start a new hobby. Who makes up these rules? Big industry advertising combined with an affluent market of consumers. If you don’t spend to “keep up with the Joneses” and their bicycling attire…you look like you are of a lower socioeconomic status. We all think status symbols are something that people did back in the 1950s. We don’t realize that status symbols surround us every day. I wonder if there’s a regional component to this phenomenon that you describe. I live in Minneapolis, a very bike-friendly city, and in general I think people here would deride the kind of ostentation you describe as common. I’d say there’s a pretty strong social pressure to NOT conspicuously display your socio-economic status through your gear. You’re lucky. There are hipster enclaves out there. But most of America is sadly bogged down by media brainwashing. Adult kick scooters can be (are) the best form of minimal transport available! They can be every day rides. I see a lot of these overweight, middle-aged, affluent guys in colored spandex jerseys going slowly on expensive bikes…and I feel sad for them. They have more money than time. They work long hours at their desks and conference room meeting tables. They want to be outdoors and athletic like they were when they were kids. So they daydream about being an athlete, spend all this money to try to “live the part”, try to show the world who they dream they want to be… And these expensive bikes mostly gather dust in the garage, maybe get ridden only a few dozen times a year. The saddest part is that these fancy racing bikes hurt those old bones, backs, and crotches. These guys would have been better off if they bought beach cruisers from the big box store. But these old fools spend top dollar because they want “the best”. We live in such a wasteful, sad world. So many wasted, sad lives.